Bentonia Baptist Church was organized in 1906 by Rev. Burl C. Conant; however, it did not apply for admittance to the Central Baptist Association until September 1909. The pastor at this time was Rev. F. W. Gunn and Mr. R. W. Martin was the church clerk. The only information given on the first report was the date of organization, the name of the pastor, church clerk and a total membership of 28, with contributions of $2.00. Records indicate some of the charter members included: Mrs. Richard Hancock, Miss Debbie Kennison, Mr. R.W. Martin, Mr. and Mrs. Harry Ogden, Mr. and Mrs. Allen Smith, Mr. C. C. Stampley, Mrs. George Strickland and Mrs. Wiley T. Williams. 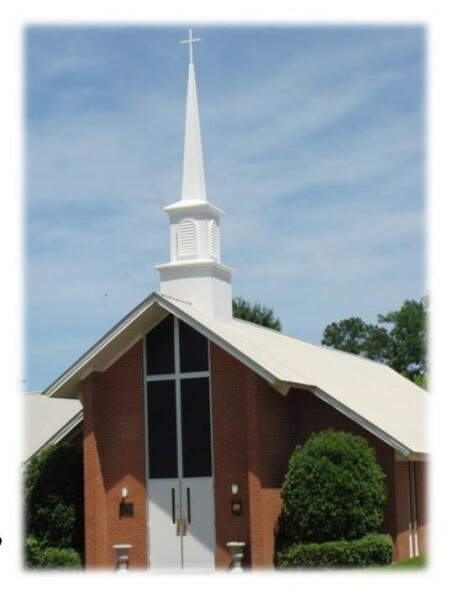 The church belonged to the Central Baptist Association from its date of admission until 1921 when the Yazoo County Baptist Association was organized and the church was incorporated into this association. For the first ten years, the Church struggled for existence; in 1916, there were only 20 members (8 men and 12 women). The church began with quarter-time preaching services, which were held in the old Union Church. This building was located on the now vacant lot near the Bentonia Methodist Church. During these early years, both Baptists and Methodists shared this facility for worship services. Preaching was provided by both denominations on a rotating basis. Sunday school classes were held in a single room with individual classes gathering in groups around the building. Baptist literature was used during one quarter and Methodist literature the next. The combined congregations continued to hold quarter-time services, except for a short period in 1920. The Baptist congregation erected its first church building in 1921 on property deeded to the church by Miss M. M. Cannon. With a grant of $1000.00 from the State Convention Board and the balance paid by personal donations, construction soon began. Mr. W. M. Gooch sawed cypress lumber for the church foundations and let the Church have it at a reduced price. Mr. Richard Hancock furnished lights without charge by connecting the church to his carbide system. Later, when Mr. Hancock installed a Delco plant at his home, the church was wired and connected to it with the current being furnished complimentary. This arrangement lasted until the Mississippi Power and Light Company ran lines into Bentonia in 1928. The church began half-time preaching services in 1939 and advanced to full-time services in 1946. In 1947, a two-story educational annex was built at a cost of approximately $6,000.00. A grant of $750.00 was secured from the State Convention Board and the balance was paid by personal donations. For a short period in 1948-49, full-time services were interrupted to allow the pastor and his family to live in the church while the first parsonage was constructed. It was also during this time that wallboards and ceiling tiles were added to the auditorium. Church members began to discuss and plan for a new church building in 1958, but it was not until March 1964 that the bid of $60,007.00, from the B. C. Rogers Construction Company of Jackson, was presented and accepted. The church paid $125.00 to have the old building removed and the lot cleaned for new construction. Final services were held in the “old church” on Sunday night, March 27, 1966. Two weeks later, groundbreaking services were held on Easter Sunday at 9:30 AM, with approximately 70 people in attendance. The congregation then held worship services at the Bentonia High School until the new building was completed in November 1966. A dedication services for the new building was held on April 9, 1967. Several former pastors gathered with the congregation for worship services and dinner on the grounds then participated in the dedication services later that afternoon. Among the gifts dedicated in this service was the beautiful stained glass scene over the baptistery, a gift to the church from Mr. and Mrs. C. L. Gooch. The congregation closed the services by singing “Blest Be the Tie That Binds” then dismissed for the day. In April 1968, the Church voted to purchase lots adjoining the church property to the south, for $6,000.00. This property eventually became the site of the present pastorium. The church gathered on September 30, 1973 for a “note burning” to celebrate the final loan payment on the new building. We were officially, “Debt Free in 73”. In 1976, dedication services were held to celebrate gifts to the church of the carillon system, given in memory of Mr. J. E. Martin by his family, and the church Steeple, given in memory of Mr. Victor Cook, Jr. by his family. In 1978, the Church accepted the bid of W.A. Passons Construction Company for the construction of a new parsonage at a cost of $51,000.00, which was completed during the summer of 1979. The church has been richly blessed through the years with gifts of land. Mrs. Helen Omohundro gave property located to the south of the church, for a church cemetery in 1984. In 2003 the railroad property across the street from the church was purchased and given to the church by an anonymous donor. In 1995 the church voted to purchase the Moore lot adjoining the church property to the north, for $20,000.00. In June of 2001, a recommendation was made to look into construction of a new fellowship hall on this property. Groundbreaking services for the new fellowship hall were held on July 18, 2004. The church voted in October 2004 to establish a line of credit with the bank for $250,000.00, then over the course of the next year the building was constructed with much help coming from volunteer labor. The first activity held in the new fellowship hall honored the grandparent’s and Senior adults on September 11, 2005. Later dedication services and an open house were held on Sunday, March 26, 2006. Once again the church property increased in March 2006, when the Richard Hancock property and residence, located to the north of the church, was donated by Mrs. Sarah Mae Rice and Mr. Lee Ronde Hancock, Jr. The church has seen success and disappointments, happiness and sorrows, births and weddings, deaths and funerals. All who have walked through its doors during the last one hundred years have left their footprints of life etched in the memories of the church. By the Grace of God, our story is never ending. So much, love so many memories. During this span God has richly blessed the congregation. Church, Pastors and all phases of the church ministry. May Bentonia Baptist Church remain faithful to our Lord and Savior as we continue to serve as a beacon of hope and strive to be God’s Lighthouse in a Mississippi Town.